Tiruninravur (Thiruninravur) is a small locality located at a distance of 35 km from Chennai, the gateway to South India. Tiruninravur has two famous and old temples - one for Lord Shiva and another for Lord Vishnu. This article talks about the temple of Lord Vishnu - Bhaktavatsala Perumal temple in Tiruninravur. Bhaktavatsala Perumal temple, which was built by Pallava kings, is one of the 108 Divya Desam temples (108 most important temples of Lord Vishnu sung by Alwars). The temple is located well at the heart of the town, next to the Shiva temple in Tiruninravur. As per the belief, Samudra Raja (the father of Lakshmi and the ocean king) worshipped the Lord here. There is also a belief that the Lord gave darshan to Varuna (the god for rain) here. Being one among the celebrated 108 Vaishnava Divyadesas, Lord in this temple graces devotees in the standing form. The Vimana-tower above the sanctum sanctorum is called Utpala Vimana. Varuna and Samudra Rajan had worshipped and had the darshan of the Lord in this temple. All full moon days, Tiruvonam star days, Fridays and Saturdays are special puja days in the temple. Saint Tirumangai Azhwar was passing through many sacred Vaishnava shrines including Tirunindravur but did not sing on this temple. Noticing that Azhwar bypassed this temple, Mother asked Lord to get a hymn from the Azhwar. By the time Lord reached Azhwar, he was in Mamallapuram. Lord demanded a song Azhwar from this place. Excited by the simplicity and grace of the Lord, Azhwar sang meaning as follows:“My Lord, protecting the whole universe, came to me to make known His love for the Bhaktas at this sacred Mamallapuram. He demanded and took a song from me.” Mother Mahalakshmi was not satisfied with one song. She asked the Lord to go back to Azhwar for the remaining 9 songs as he used to sing 10 for all temples. Azhwar has already left Mamallapuram and had reached Tirukkannamangai. He saw Lord with a side look waiting for him and in the Pathigam (10 songs) on Tirukkannamangai Perumal, Azwar included Tirunindravur Perumal also in the hymns. Once, Mother Mahalakshmi (Tiru) left Perumal due to some reasons, came and stood (Nindra) here, hence, the place came to be known as Tiru Nindra Oor (place). Her father Samudra Rajan (as Mahalakshmi was born in the milk ocean, the king of oceans-Samudra Rajan is Her father) came to her, cooled Her anger and asked Her to go back to Her Lord Perumal, she refused. The king of oceans went to Perumal and begged Him to come and take back his daughter Mahalakshmi. Lord asked him to go before Him and assured to follow him. Samdra Raja told Mahalaskshmi that he was not her father but She was his “Ennai Pettra Thayar” ‘You who gave me birth’ and requested Her to come back to Vaikunta and rule the world. Perumal too joined the compromise, Sri Mahalakshmi went back with Perumal. As Lord responded to the prayer of Bhakta (devotee) Samudra Rajan, He is called Bhaktavatsalan. 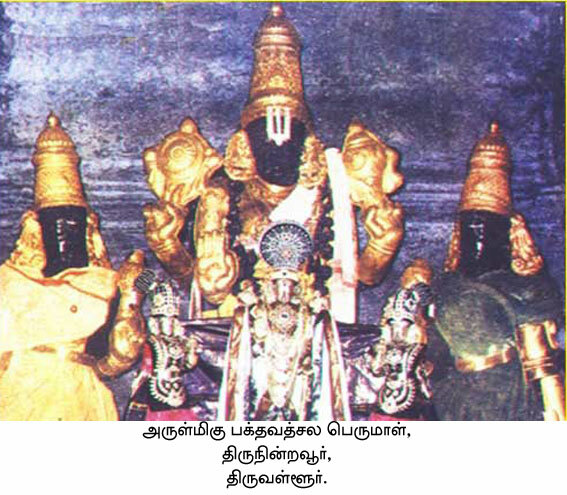 As Samudra Rajan said “Ennai Pettra Thayar” that came to stay as the name of Mother of the temple. Also as prayed by Samudra Raja, they are gracing together in the Wedding Form. The main tower of the temple stands majestically built during the Vijayanagara period. Passing the Bali Peeta, flag post Garuda shrine, Maha Mandap and the Inner Mandap, 11 feet tall Lord Perumal accompanied by Sridevi and Bhoodevi graces the devotees with His five weapons. Thayar shrine is right of that of the Lord. There are shrines for Andal, Azhwars, Sri Hanuman, Eri Katha Ramar and Adhi Sesha. When Kubera lost all his wealth, he prayed to Ennai Pettra Thayar – Mother who gave me birth – and got them back, according to scriptures. Mother Goddess is all merciful raining all prosperities to Her devotees and is praised as Vaibhava Lakshmi. Divine serpent Adisesha has a special shrine in the temple. It is the faith of people that worshipping Sri Adisesha on Wednesdays with ghee lamp and offering milk porridge – Paal Payasam – as nivedhana would relieve those affected with snake aspects and from the adverse effects of Rahu-Ketu planets. It also strengthens the benefit of the Mangal Sutra of women. A visit to this temple is said to help people recover lost wealth/glory. Bhaktavatsala Perumal Temple has a beautiful tower (Rajagopuram). Once you enter into the east facing temple, you can find the flag staff (dhwajastambha) opposite to the main shrine. The main shrine has the big idols of Lord Vishnu, called as Bhaktavatsala in this temple, in the standing posture, along with his consorts Sri Devi and Bhoo Devi on either sides. The utsav (procession) idols of Lord Bhaktavatsala along with his two consorts are also placed in the main shrine. Opposite to the main shrine, as usual there is a small shrine for Garuda. The temple has one corridor (prakara surrounding the main shrine), which has various small shrines. There is a separate shrine for the Goddess named as 'Ennai Petra Thayar' a beautiful Tamil word meaning 'My mother'. There are also shrines for Anadals, Chakrathalwar, Adi Sesha, and Mudaliyandan in the corridor. Inside the main shrine, near the sanctum for Bhakthavatsala Perumal, there is a small shrine for Yoga Narasimha. A pillar containing the figure of Narasimha has also been made like a small shrine. Outside the temple, Lord Hanuman is available in a separate shrine facing the main temple. Panguni Tiruvonam in March-April, birth star days of Sri Vaishnava Acharyas and 12 Azhwars, Chitra Poornima in April-May and Wedding festivals, Deepavli in October-November, Tirukarthikai in November-December, Vaikunda Ekadasi in December-January, Masi Magam in February-March, Thai Pongal and Ratha Sapthami in January-February are the festivals celebrated in the temple. The temple is open from 7.30 a.m. to 11.30 a.m. and from 4.30 p.m. to 8.30 p.m. Priest : A.R. Manivanna Bhattar @ 044-26390434 / 9380516055.